I’ve been using the lathe to make bowls and realized I needed a way to grip the top of a bowl so I could work on the bottom. There are commercial products out there to do this but they cost a fair amount. So, I looked around and came across something called a Longworth Chuck. It’s named after the inventor and consists of two disks that rotate and move self centering jaws to grip the bowl. As opposed to repeating the instructions of how to make one I’ll refer you to a couple sites: Site1 and Site2. To build my chuck I used a piece of 1/2 and 3/4 plywood. 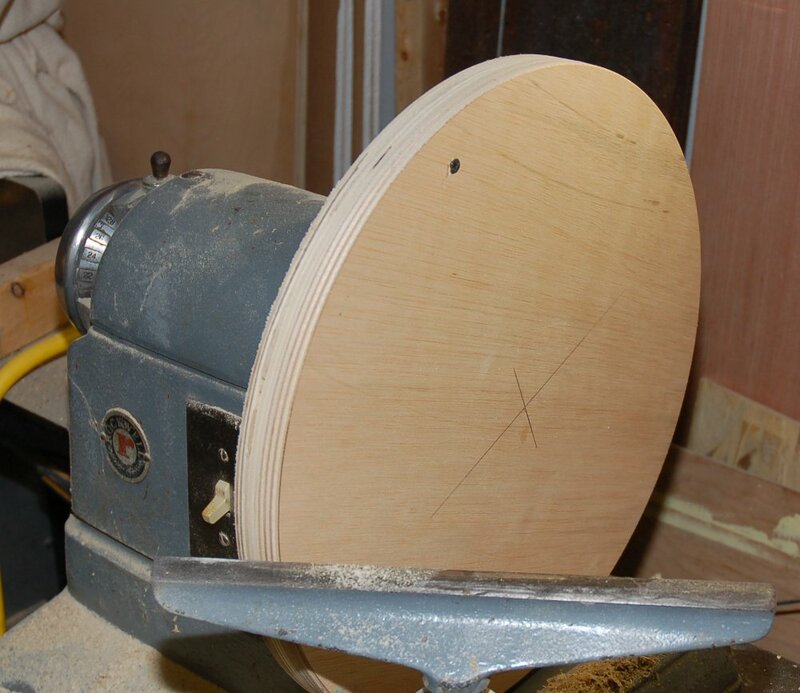 Since my lathe has a capacity of 16″ I made my disks 16″ in diameter. Next, I mounted the mounted a faceplate on the 3/4″ piece and screwed the two disks together. 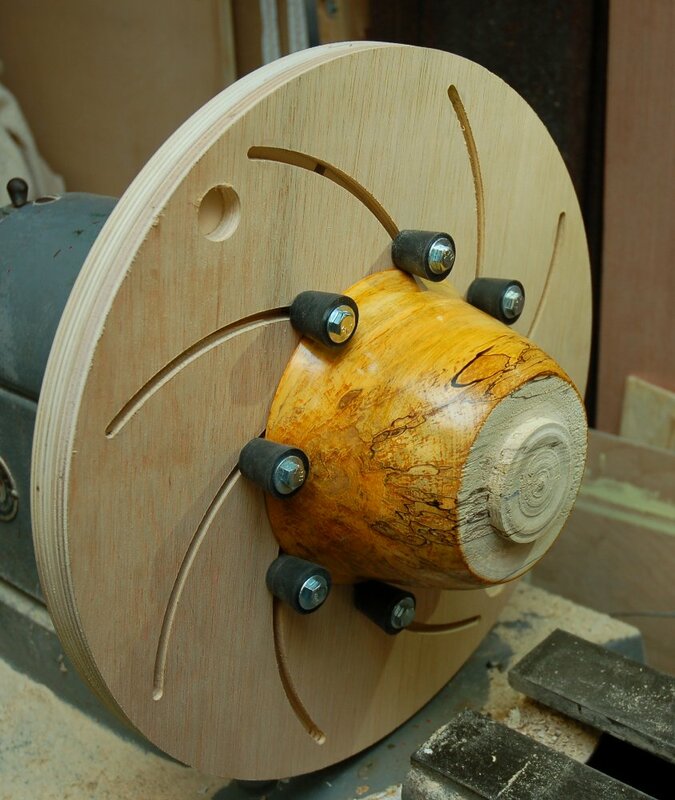 I then turned them round on the lathe. 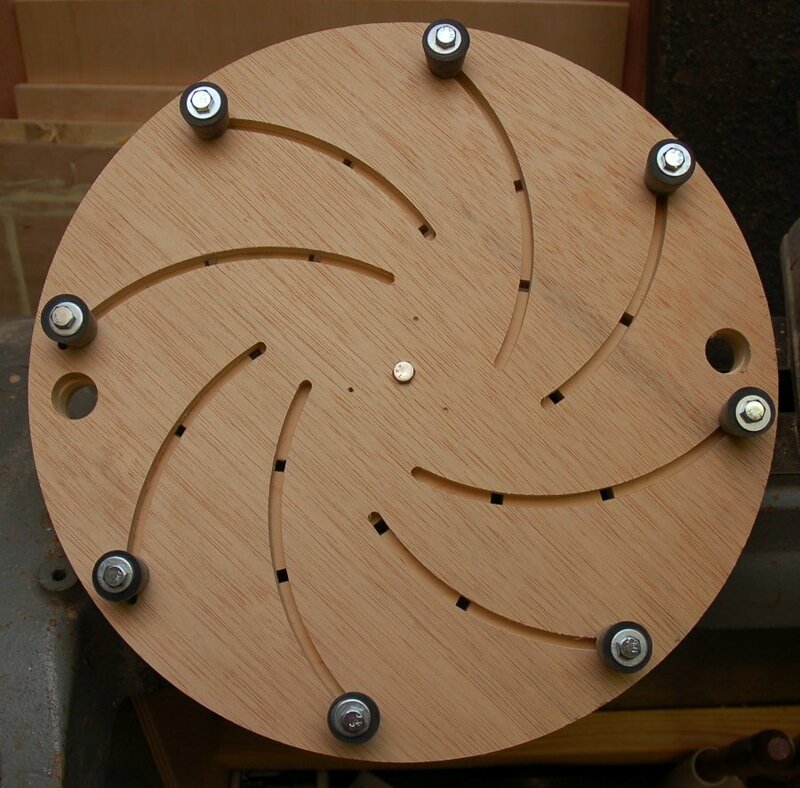 What makes the chuck work is a series of arcs that are routed into both disks. The web pages linked to above describe how to layout the arcs. 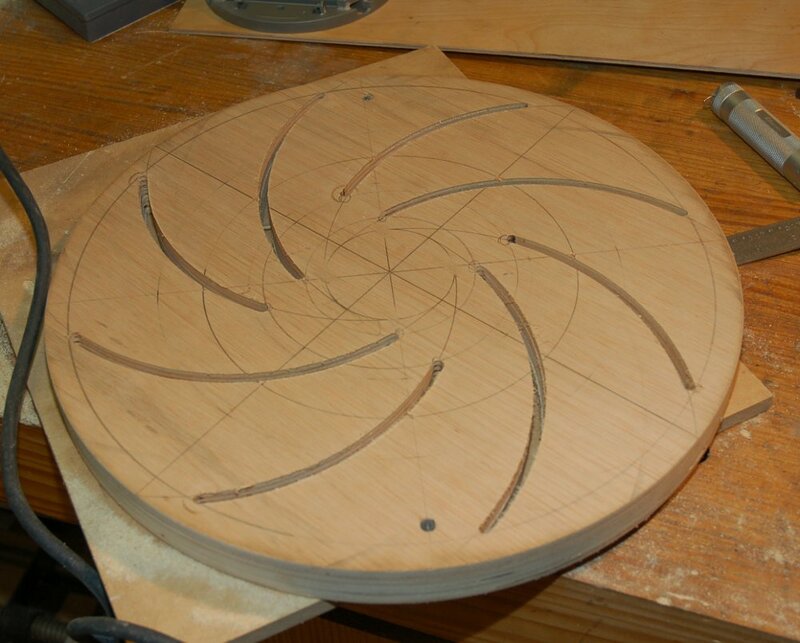 The arcs are cut into both disks at the same time with a router using a 1/4″ bit. You then flip one of the disks over. Now the combination of two arcs results in a hole that a 1/4″ bolt fits through that will move when one of the disks is rotated against the other. Note that four of the arcs are larger than the others. This was done to keep from weakening the disks too much. Since smaller bowls don’t require as much holding power, the four bolts in the shorter arcs are removed to allow the jaws to contract more. Since using the bare bolts on the bowls would mar the surface, rubber stoppers are used to create soft jaws. The stoppers don’t have holes in them so I had to cut some. To do this I created a “cork borer” by sharpening the end of a 1/4″ brass tube. I used a piece of PVC to hold the stoppers and chucked the brass tube up in the chuck on the tail stock. 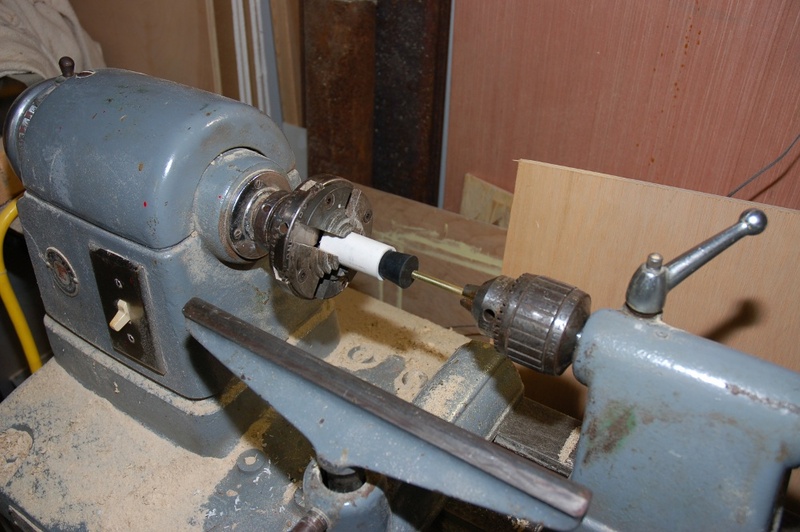 With the lathe running at a low speed I advanced the borer into the stopper resulting in a centered hole. The longest step in this process is removing the rubber plug out of the borer each time. With all the stoppers bored assembly can commence. I used 1/4-20 x 3.5″ long bolts and wingnuts to permit hand tightening. Below is a picture of the completed chuck opened as wide as it will go. 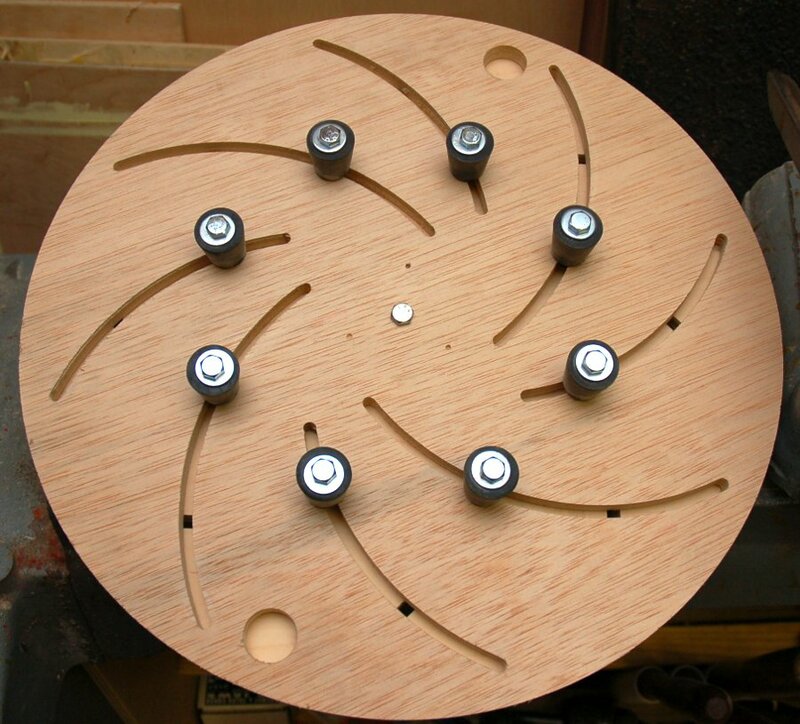 The two large holes allow you to rotate the disks with your fingers. The front disk is rotated to move the jaws in as shown below. 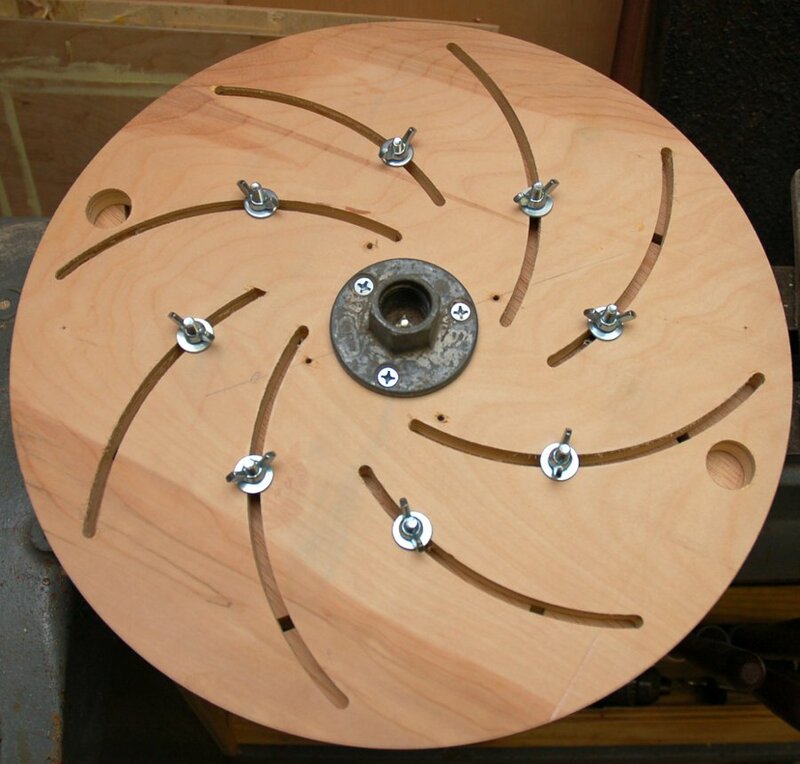 Here’s a view of the back of the chuck showing the wingnuts and faceplate. Here’s a shot of the chuck in use on one of my bowls. It works well though it doesn’t perfectly center the bowl every time due to the bolts tilting, the rubber bending, etc. But with careful placement of the bowl and tightening down opposite wing nuts at the same time the bowl can be centered well enough. It cost about $10 since I had the plywood and faceplate on hand and only took 2-3 hours to make. For the time and money spent it works great! Your ingenuity never ceases to amaze me. Great work! I can’t take credit for this one. Someone else designed it and I just made one.